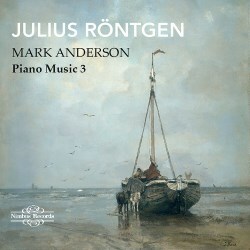 Like the first volume in this series, but not the second, (see volume 1 and volume 2) Mark Anderson and Nimbus prefer a cross-generational approach to Röntgen’s piano music, combining a work written in his teens with one written 45 years later, and adding an unpublished Sonata in A minor for good measure. The 1898 Sonata in A minor was never published and exists not in Röntgen’s but a copyist’s hand. Fortunately for inquisitive musicians, Mark Anderson has created, as the notes relate, a modern edition of the Sonata which is available via Nimbus Publishing. This is a four-movement work, opening with tempestuous intensity, cast adrift in a stormy landscape, or maybe seascape as the music evokes rolling waves of sound. Rolled chords introduce the solemn theme and variations second movement, an antique-sounding bardic quality suffusing the musical paragraphs. Whether deft or grand, this is another example of Rontgen’s almost remorseless self-confidence, not least in the fugato-sounding lines or the beautiful lyricism embedded in the music. After a brisk Minuet the finale seems to coalesce the twin influences of Chopin and Brahms. An uneven work it may be, but it is surely too packed full of interesting moments to have been overlooked for so long. It helps to have so idiomatic a performer as Anderson on hand. Thus, the third volume manages to explore early and mid-period Röntgen, adding a work that must be all-but-unknown except to Anderson and scholars of the composer.